The company recently released a new Blackout Pocket, a standalone pocket made to keep your most sensitive information private using a technology similar to that which law enforcement and the military utilize to preserve electronic evidence. Ideal for gadget loving travelers, the pocket is designed to protect your cell phone, credit cards, passport, and mobile devices from the nefarious efforts of identity thieves, RFID (radio-frequency identification) skimmers or NSA surveillance. I get asked this question a lot from friends, family and travelers who want to know more about the camera apps and processing tricks I use to capture, edit and share iPhone photographs. I’m enamored with every aspect of mobile photography - the creative apps, the shoot-and-share convenience, the pocket size ease - and it’s changing the way I shoot, edit and deliver images, both personally and professionally, on a daily basis. Barking dogs, tolling church bells, blaring music, parading bands, exploding fireworks, police whistles, sirens, and crowing roosters are among the many noises that make up the soundtrack of life in Latin America, our home-away-from-home for nearly two years now. Like many visitors, we have a love/hate relationship with the auditory vibrancy of the Latin American lifestyle. Most of the time, the crazy cacophony charms and amuses us. At 3AM, not so much. Not to worry: There’s an app for that. Nearly every traveling photographer I know lusts after the ‘perfect’ camera bag. I am, perhaps, the biggest romantic of them all. No matter how many alternatives fill my closets and clutter my office shelves, the dream of finding that ‘perfect’ multi-purpose bag remains alluring. Problem is, I ask a lot of a camera bag, especially for air travel. It needs to provide travel-tough protection, be carry-on sized and not only transport a full arsenal of camera bodies, lenses and digital accessories, but a laptop too. Enter the Lowepro Stealth Reporter D650 AW. The Genius swarm was unexpected. Who knew that carrying my MacBook Pro into the Apple Store in a BookBook laptop case would inspire such a flurry of questions: “Is that really a lapbook case?” “Where did you get it?” “Who makes it?” “Do they make one for the iPad?” “Can I look inside?” “Wow, cool!” I felt like a rock star. I didn’t buy the cleverly disguised laptop case that looks like an antique book to be the chicest geek at the Genius Bar. Rather, I’d bought it to reduce the risk of having my MacBook Pro stolen. But based on the number of blue-shirted Genius admirers, it looks like innovative Mac accessory designer, Twelve South, has tapped into the collective desire for originality that’s core among true Mac fans. At home or on the go, Skooba wraps are one of the most versatile, lightweight protective packing solutions I’ve found. Whether I’m protecting an extra camera lens in my daypack on the trail in Costa Rica, toting a bottle of wine in my purse to a friend’s party, or bringing home a ceramic bowl from Morocco in my carry-on luggage, the wraps are perfect for adding extra protection without a lot of bulk. Available in three padded square sizes, the Velcro fasteners on all four corners make it easy to wrap around any shape, virtually eliminating the need to buy custom-sized cases for every gadget. Buy once. Use forever. Nice! I was flying back from Boston recently when I spotted my seatmate tapping and flipping his way around a touchscreen smartphone that at first glance looked like an iPhone - until I spotted the Verizon logo. If you’re a Verizon user, like me, you’re all too aware that Verizon doesn’t have an iPhone (or didn’t at the time of this review). Was this the answer to my prayers? I had to know more. Verizon HTC Droid IncredibleSo I did what any gadget girl would do, I peered over the poor guy’s shoulder long enough to break his concentration and compel him to ask if there was something he could help me with. Thankfully, he proved to be as big a geek as I am and couldn’t wait to show me around his newest toy - Verizon’s HTC Droid Incredible. We talked travel tech the rest of the flight home. I love my BlackBerry, I do. But I was enchanted enough by the Incredible’s spacious screen and iPhone-like behavior to take it for a 30-day test drive. I found plenty to love about the Incredible, including blazing fast performance, a 3.7-inch touchscreen, eye-pleasing graphics and a super sleek design. In side-by-side web searches and site uploads, its Google powered Android 2.2 operating system left my BlackBerry at the curb. And surfing the Net felt as easy and fast on the Incredible as it does on the computer. But I wasn’t nearly as comfortable navigating the Droid’s virtual QWERTY keyboard as I am when using the BlackBerry’s real deal. Okay, I admit it. I thought expensive noise reduction earphones were just another fad for people with more money than sense. That was until an American Airlines business class flight to France with complimentary noise cancelling headphones changed my mind. Muting out the roar of the engine and the guy snoring in the seat across the aisle, the headphones made the nine-and-a-half-hour long flight bearable - almost pleasant. Biz class upgrades aren’t a staple in my usual econo-class flight plans. But thanks to Santa and a new pair of Able Planet’s Clear Harmony noise cancelling headphones I can now tune out the chaos in style. Better yet, they work great for fading out distractions in my home office, too. I’m wearing them as I type, much to the chagrin of my husband who just realized he’s been talking to himself. Favorite feature: Comfort! The padded ear cushions are so much better for long haul listening than earbuds. Not-so-favorite feature: The obvious. Despite the fold-flat design, they’re big. Big enough in these days of diminishing carry-on allowances to make me think twice about toting them along. Bummer! Bottom line: No way, no how am I jetting off for a 5-hour-plus flight without them. Something else can give. For the next two weeks, I’ll be participating in the first Travel Blogger’s Caravan. I’d like to invite you to follow 15 top travel bloggers (including yours truly!) for a chance to win a motley array of prizes, perfect for celebrating the holiday season. If you love exploring new destinations and revisiting old favorites, you won’t want to miss the Travel Bloggers’ Caravan & Giveaway! You just may discover a few new favorite travel blogs to bookmark. I know I have! Help us kick off the Caravan right now! Follow @luxcruisebible on Twitter and then tweet about the Travel Bloggers’ Caravan between December 1 and 15. 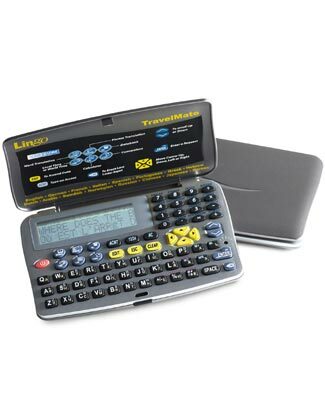 Include a link to this blog post and the #caravan hashtag and you’ll be entered to win the Lingo 16-Language Translator, courtesy of Magellan’s Travel Supplies. Entrants must have a U.S. mailing address. Entries must be received between December 1–15, 2009. One winner will be randomly chosen from eligible entries on December 21, 2009. Winner will be notified via Twitter DM (direct message). A Gadget Girl’s list is never short, but gift-giving for your favorite traveling shutterbug just got easier. Many of these gift recommendations are items I already use and am crazy about, a few are from my own wish list (Santa are you listening?) and the rest, well, I never was good at restraint, are already in the mail. To Lose or Not To Lose? Cool New Microchip Bag Tag. A few months ago Southwest Airlines misplaced my friend Julia’s suitcase on a non-stop flight. YIKES. Okay, stuff happens. But here’s the rub: when Julia asked the airline to tell her if her bag was still in Phoenix, where she’d boarded, or on it’s way to El Paso, where she’d landed, or, for that matter en route to Timbuktu, they couldn’t tell her. Their reply; “Um, sorry mam, but we don’t have a scanning system for luggage.” Huh? You mean the grapes at my local co-op have a bar code, but not my luggage? As a Southwest frequent flyer, I was NOT thrilled to hear this. Last year alone the number of items of luggage misplaced by airlines rose from 30 million to 42 million, an increase of 40%. In addition, receiving compensation for a lost item of luggage is dodgy at best unless receipts can be provided for everything that was in the lost bag. Hence, the need for travel insurance. But that’s a story for another day. A new UK startup, ReboundTAG, has been working with help from the International Air Transport Association along with several airport systems developers to come up with a better solution. Their answer to the problem is a microchip bag tag designed to reduce the chances of losing personal belongings. 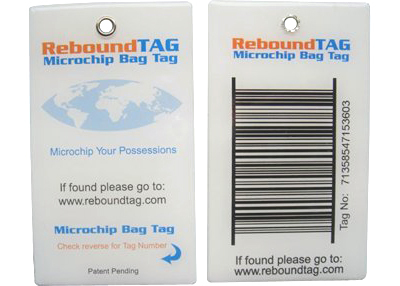 There is also a barcode and number printed on the microchip bag tag to insure that they function in airports where there are no microchip readers. And here’s the really cool part, when the luggage is found the owner receives an email and an SMS (text) to their mobile phone immediately. Available in two compact models, Rogue 1 (4.5 inches) and Rogue 2 (6.5 inches) and three stylish colors: silver, green and black. Comes with a handy lanyard so you can wear the light or attacht it a backpack. If, like me, you’re still on the fence about buying a Kindle, Amazon has just release some tempting news. First, their bestselling Kindle is now $259, down from $299. Second, they’ve introduced a new addition to the Kindle family: Kindle with U.S. and International Wireless. Hooray for travelers! Now traveling bookworms can download books, newspapers, and magazines wirelessly while at home or abroad in over 100 countries. Whether you’re in New York, Paris, São Paulo, Mumbai, Beijing, Tokyo, or Sydney, you can think of a book and be reading it in less than 60 seconds. That’s sooo cool! If you have only … a minute. Print your cell phone photos, travel pics or latest masterpiece using one of these pocket-sized printers to whip up hard copies in no time. Fun, compact and cool, cool, cool. Get those photo faves off your hard drive and into the hands of your new BFF. Print, display and preserve beautiful borderless photos that are water-resistant and last up to 100 years! Enjoy photo lab quality with 4” x 6” images produced in approx. 47 seconds. 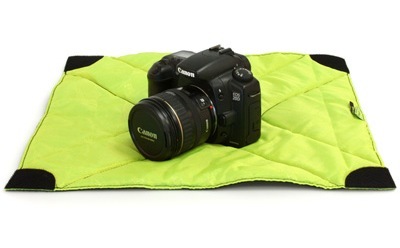 Available at www.estore.usa.canon.com or at The Travel Store at EllenBarone.com powered by Amazon. 2 x 3-inch borderless color images in under a minute. 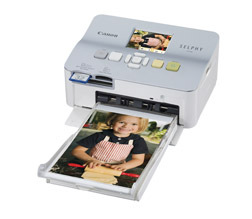 Camera Phone Wirelessly transfer images from a Bluetooth-enabled camera phone to the Mobile Printer and print instantly. Using the built-in OBEX (object exchange profile) Bluetooth in the phone and the printer, connecting and printing becomes instant. Digital Camera Instantly printing images from a digital camera is as easy as connecting the USB cable to the PictBridge-enabled camera and printer. Once connected, follow the PictBridge screen on the camera display. Simply select what image to send to the printer and within 60 seconds, the print is ready to be shared. Available at www.polaroid.com or at The Travel Store at EllenBarone.com powered by Amazon. A carry-on-ready projector with enough resolution for impromptu movie nights, traveling business presentations and vacation photo slideshows? Yep! 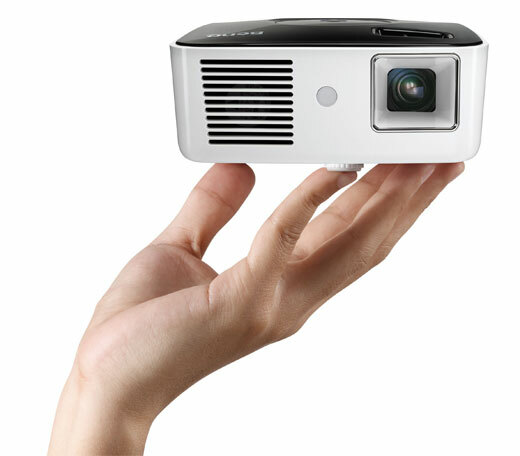 I’ve been on the hunt for a ultra-portable projector that wouldn’t break the bank, and found it in the new $499 BenQ Joybee GP1 Mini Projector. Give dad the travel toys he’ll love. A while back I was fortunate enough to be asked to sign on as the new Green Gear girl at GreenSpot.travel, a wonderful online portal for environmentally responsible travelers. This month’s featured product is a nifty new eco-friendly gadget - the SteriPEN JourneyLCD portable water purifier. It’s fast (16oz. in 48-secs), lightweight (5 oz), easy (just one button) and effective (proven to destroy viruses, bacteria and protozoa). Oh, and did I mention it runs on rechargeable batteries, purifying 1 liter of water for less than $0.02 USD? Take THAT you 3-Euro bottle of San Pellegrino! And, even better, because the pen uses light, instead of chemicals, there’s no chemical aftertaste like tablets or drops. I’m hooked. Whether I’m day hiking in the mountains of New Mexico, sightseeing in Marrakech or shopping in Paris, I’ll have the SteriPEN in my bag. Available at www.steripen.com or at The Travel Store at EllenBarone.com powered by Amazon. About Ellen Barone: Consumer travel expert Ellen Barone is the founder and publisher of TravelUpdatesbyEllenBarone.com and YourLifeIsATrip.com. She’s currently at work on her first book - I COULD LIVE HERE. Click here to learn more or stay connected on Twitter at,Facebook, Google+ and LinkedIn. The techie in your brood will love this new twist on the classic Swiss Army knife; the Swiss Army Multitool with USB Drive. With the addition of a detachable USB drive and LED mini-light no self-respecting digital traveler will want to leave home without one. Use it to transfer and share your vacation snaps, illustrate your Power Point presentation with its red LED light ray, screw a battery compartment shut, file your nails or snip the tag off that new dress, female or male, this is the ulitmate geek gadget. $69.95; National Geographic.